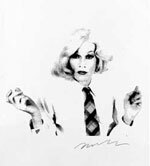 I asked Andy Warhol to help with a Polaroid ad campaign the 1980s. I was one of the only UK art directors who had approached him. The poster campaign didn't happen but when he was in London, we kept in touch. 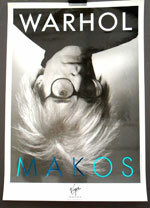 After he passed away, I produced the Warhol/Makos a photo-bio of his day- to-day life. The book was my belated thanks to him. This controversial image from a Christopher Makos image, printed poster on heavy paper.